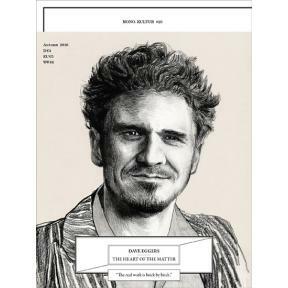 Autumn 2010 marked mono.kultur’s fifth anniversary as well as our 25th issue, for which we decided to treat ourselves to working with a like-minded spirit: the American writer, publisher and literary entrepreneur Dave Eggers. Dave Eggers is a busy man: not only an appraised author since his biographic debut novel ‘A Heartbreaking Work of Staggering Genius’, Eggers also founded the highly successful literary magazine ‘The Believer’, single-handedly revived the short story with his publishing imprint McSweeney’s, founded permanent writing workshops for disadvantaged youth all across America, and recently scripted the acclaimed Hollywood productions ‘Away We Go’ by Sam Mendes and ‘Where the Wild Things Are’ by Spike Jonze. In short: Eggers is the man who will leave no stone unturned to lure you back to the printed page. His unique tone of writing provides the perfect soundtrack to the confusion and disillusionment of his generation, oscillating wildly between hyperactive optimism and lethargic melancholy. With mono.kultur, Dave Eggers talked about the rendezvous of fiction and life, how to be political on eye level and why there’s never been a better time for literature than now. Visually, the new issue is a treat: unfolding into one large poster, it can be read as a map to the universe of Dave Eggers, with references to nautical charts and explanatory legends – not to mention the original drawings by Captain Eggers.